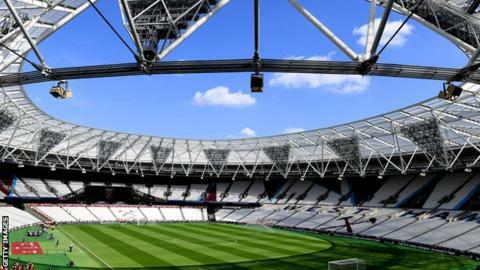 London Stadium's owners want West Ham to retract a claim that they "deliberately misled" the public when stating the Hammers' rent "does not even cover the cost of matches". The London Legacy Development Corporation (LLDC) said on Friday it faces "97 years of losses" partly due to "low rents" paid by West Ham. The Hammers disputed this, also claiming they contribute a total of £10m a year in revenue, including rent. However, the LLDC says this is "wrong". It said the club "pays us around £3m a season", adding: "It remains a fact that the West Ham usage fee does not cover event-day costs." Following last week's LLDC appearance before the London Assembly, the Hammers released a statement in which they criticised its "strategy to point the finger at West Ham United". The club said it was "concerned" that "the public and, more importantly, taxpayers" were being "deliberately misled" over the long-running financial struggles of a stadium that was built for the London Olympics in 2012. In July, it was revealed £450,000 of taxpayers' money had been spent on unsuccessfully searching for a sponsor for the venue, which cost £323m to convert into a football ground after an original estimate of £190m. A letter sent by LLDC chairman Sir Peter Hendy on Monday in response to West Ham's statement read: "This is an extremely serious and damaging statement to make against public officials appearing before elected assembly members and we will be asking West Ham to retract the claim." The letter adds: "Their claim that we enjoy £10m from our association with West Ham is simply wrong and the money we generate from West Ham does not cover the cost of putting on the match days. "We are not pointing the finger at West Ham for this, it is just a fact and something we have to deal with. "We also said that the West Ham contract was just one area which caused financial problems for the stadium. The others we laid before members included the cost of seat moves from football to athletics and back again, our contract with UK Athletics and the stadium operator and high running costs. "These are all areas we are tackling and making progress in getting on to a sound financial footing."